By Alex Marcondes. Aug 30, 2015. 9:00 AM. As history documents, Ernest Shackleton and his fellow crew members embarked on the Imperial Trans-Atlantic Expedition to walk across the Antarctic continent in 1914. Trapped in ice floes, they were forced to abandon ship several months into their journey and retreat. We struggle, at times, to understand why we're captivated by such endeavors. They failed, after all, and walking across the continent doesn't seem to be an especially worthwhile project. However, there is a measure of catharsis available to all who hear these stories. Just as Aristotle describes the cathartic nature of the theatre, the legends of these explorers bleed us of our insecurities, inadequacies, and hopelessness in the face of seemingly insurmountable anxieties. The threat of death at the hands of mother nature must have been terrifying; but, to be able to endow meaning onto the adverse conditions they found themselves in, to believe that there was some reasonable source behind it was, we can imagine, must have been just as comforting. The cathartic effect of exploration narratives advertised can only happen, of course, if there is a coherent narrative of the events. For this reason the chroniclers of these men and women, those who seek to go out and risk their lives in the pursuit of an extreme feat, render to us the ability to purge ourselves of existential anxieties. The troubling circumstance of being threatened by mother nature is one that transcends cultural, ethnic, and socio-economic boundaries. Not even a spectacular imagination is required to experience at least part of the disturbing events these explorers encountered. Shackleton's story has been exposited by a notable few, himself included. His autobiographical account, South!, is nothing short of exhaustive. He manages to describe, in at least some detail, every day of their journey. While not the most exciting of writers, Shackleton's obviously unique insight into what it felt like to be trapped in ice floes and to have to abandon the ambitious expedition is unrivaled. 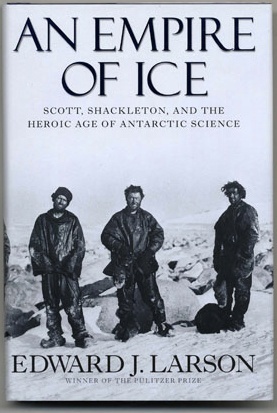 Edward J. Larson's account groups Shackleton with Robert Scott and explores the scientific significance of these two men's expeditions, as well as the contrast between the former two and Roal Amundsen, who sought only to reach the pole first and cared nothing for the scientific advancements capable of being made upon arriving there. Larson promises us that the, "less-told tale of the explorers' scientific activities is often as gripping as the story of their polar quest." He admits, however, that even though these men set out for the sake of science, their stubbornness in mapping the area was undoubtedly seated in pride. Fame certainly awaited whomever reached the pole first, and can you imagine the fame that would come with trekking across the continent on foot? On the other side of the globe, we find the likes of Louise Arner Boyd exploring eastern Greenland and the North Pole. As the first woman to fly over the North Pole, Boyd is a prime example of American women explorers in the 20th century. Early American suffragist, Annie Smith Peckd became the first person to successfully scale Huascarán in Peru — at the time the tallest peak to be scaled in that country — along with repeating climbs on several other South, Central, and North American extreme peaks. 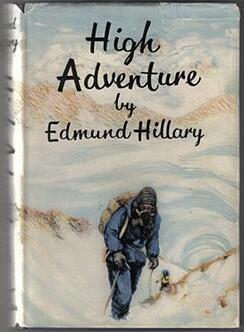 She, like Shackleton, wrote an autobiographical account of these climbs, The Search for the Apex of America. She and Boyd, unlike Shackleton, however, have not been widely celebrated as great explorers whose stories are worth reading. 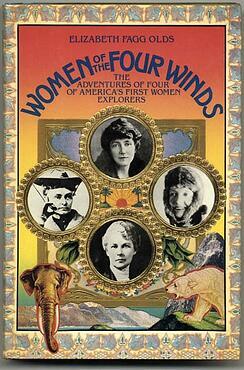 For this reason, Elizabeth Fagg Olds' book, Women of the Four Winds, is significant because it does celebrate these women and develops thrilling narratives around their exploratory feats. These women are no less helpful in our cathartic search than the men of the "Heroic" Age of Antarctic Exploration. Of course, pushing the boundaries of human reach did not stop at the two extreme ends of the earth. While Peckd reached the top of Huascarán in 1908, only fifty-one years later Apollo 11 landed on the moon. Since then, there were five more manned lunar landings in addition to the original Apollo 11 mission. Films and books alike grip us: Apollo 13 — the film adaptation of Jim Lovell's first hand account, Lost Moon — became one of the most critically acclaimed historical dramas. And films like Gravity and Interstellar continue in this tradition. Science fiction of this sort speaks to a foundational part of the human psyche, challenging it to imagine harrowing situations that end in monumental victories. Aristotle's conception of tragedy depended on catharsis, on story telling, "through pity and fear effecting the proper purgation of these emotions." The efficacy of tragedy — and of the tales of explorers facing nature's most harrowing boundaries, no less — depends on the invitation towards pity and fear that helps us to release these emotions. Indeed, Ernest Shackleton's expedition, Apollo 11 and especially Apollo 13, Sir Edmund Hillary and Tenzing Norgay's summit of Mount Everest, and so on, tug at our emotions and leave us at the edge of our seats, unable to resist the temptation to marvel and revel in their victories in whatever form they might come, eliciting pity and fear as we relate ourselves to the plight of those we read and hear about.